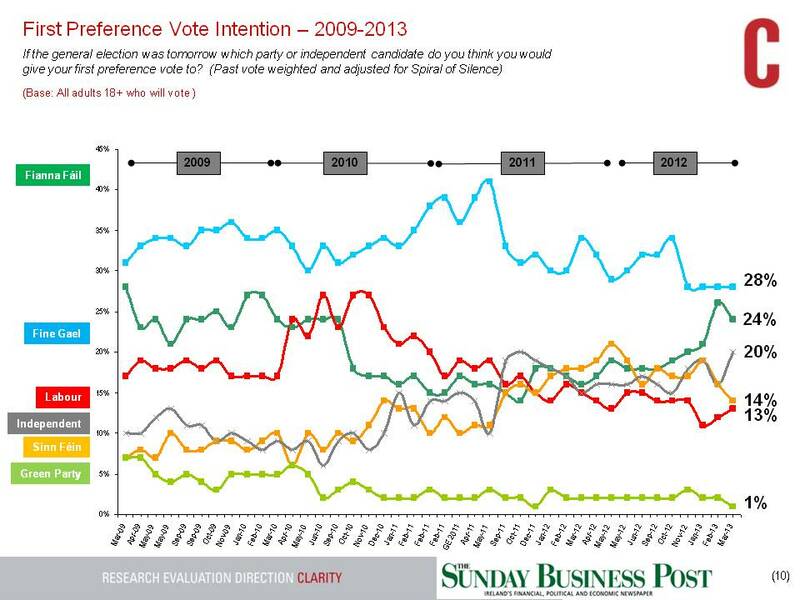 Over many years the RED C Sunday Business Post tracking polls have clearly shown the value in analysis voter behaviour over longer periods of time, rather than focusing on change from one poll to another. The benefit to regular polling with tight controls is that we shouldn’t really see big shifts every poll, but should rather be interested in the underlying trend in the longer term over three or four polls. Of course occasionally events do conspire to see relatively large changes from one poll to another, but this is the exception rather than the rule. We employ several techniques designed to give stability to our polling, in order to be sure we can trust trends and don’t regularly see spikes in support for one party or another. These include very careful sample selection, with adequate mobile sampling and randomised number selection, to ensure every household has an equal chance of being reached; and questions are both worded and ordered, so as to minimize bias and ensure parties have an equal representation. We also use techniques such as analysis by likely voters, and weighting by past vote to ensure our sample, and in turn their vote intentions are not biased. Cutting the data by those who actually will go and vote, and prompting the parties that can be chosen also ensures we keep undecided voters to a minimum at just 18%. While we also re-allocate 50% of undecided voters based on their past vote, rather than simply removing them, and as such assuming they will vote in the same way as those who are decided. It is clear from the trends seen across our last five to six polls that despite the government parties losing a chunk of support in the run up to the last budget; since then their fortunes have been relatively stable. This is a very different message from the one that appears to have been reported recently, so let’s take each of the government parties individually and look at this more closely. 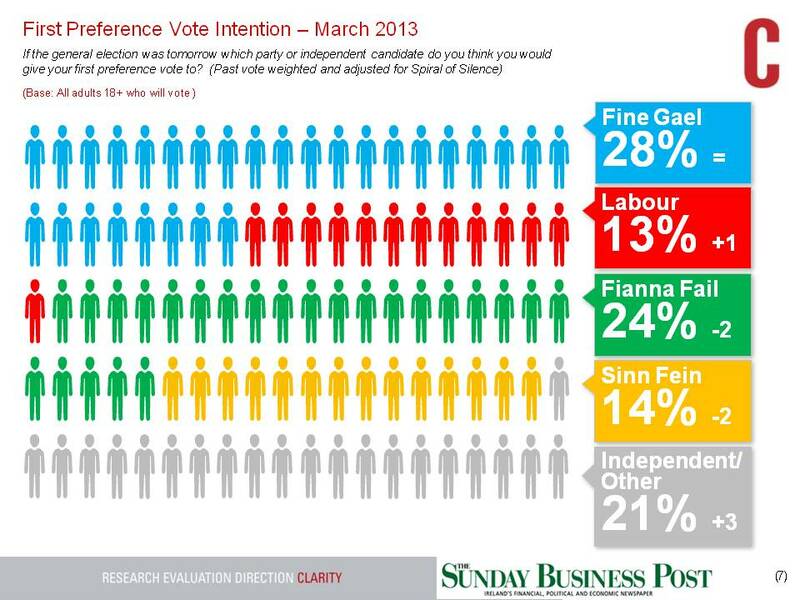 Fine Gael secure 28% of the first preference vote in today’s poll. This is the same as they were seen to secure in the previous three polls conducted in November, January and February. The party did certainly lose support between October and November last year, as the details of the budget emerged, but since then they have managed to retain support despite the introduction of the property tax, which we see elsewhere in this poll is potentially very negative for them. In fact 60% of voters overall, and 50% of those that supported Fine Gael at the last election, suggest that the introduction of this tax makes them less inclined to vote for the government parties. This does fall back to 40% of those still supporting Fine Gael in this poll, but still suggests this tax remains a significant threat to future support, especially as voters have as yet not had to physically pay for it. Labour secure 13% of the first preference vote in today’s poll. The party has certainly seen their levels of support fall back quite heavily when we look back over the past two years; but more recently this has also stabilised, with Labour securing support within a 3% margin of error above and below the 12% mark for the last five months, and in fact seeing an upward trend over the past two months. For Labour the situation remains a bit more fragile, with 57% of those still supporting the party, suggesting the introduction of the property tax makes them less inclined to vote for government parties, and we know from previous work that there is some disquiet among Labour voters with many feeling that promises haven’t been kept, and the fairness they sought from the party has not been apparent. That said, rather than government parties in crisis, this does suggest the picture is one of a more “normal” backlash against a government in the midterm between elections, but not a meltdown at this stage. There is also clear evidence in the medium term trends, of a move back toward Fianna Fail; particularly among voters who were once strong supporters of the party, and for whom the flirtation with either Labour or Fine Gael has been unrewarding. However, this move back to Fianna Fail is also perhaps more gradual than some have suggested. In the RED C polls during the end of 2012 the party recorded a gradual increase in support month on month, this trend was the first indication that the party was emerging from its so called “toxic” status. The suggestion that it may be acceptable to vote Fianna Fail again in the media, possibly encouraged more to this view, which saw a sharper increase last month. Today’s result however, which sees the party secure 24% of the vote, looks more in line with the longer term trend, that of a party on the up, but at a more gradual and considered pace. 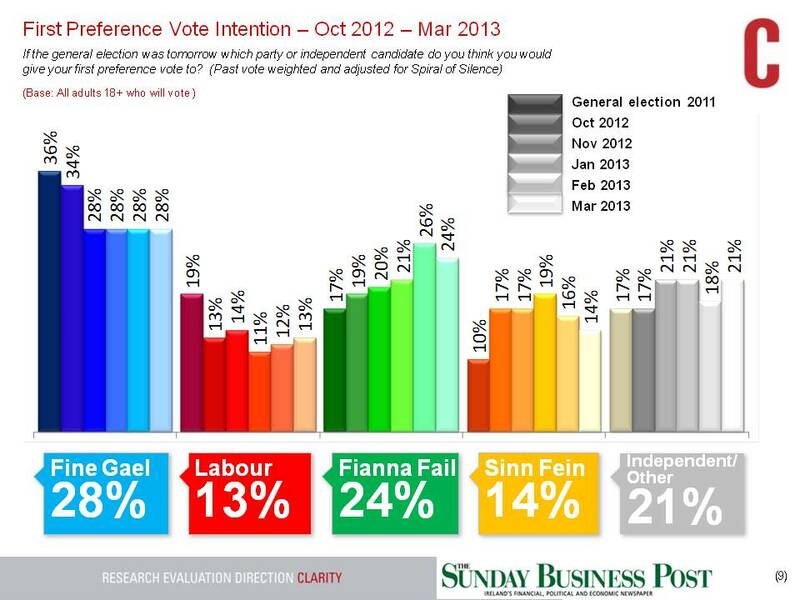 Sinn Fein appears to be the one party where the medium term trends appear to suggest a decline in fortunes. The party secures 14% of the vote in this poll, which is the lowest they have seen since the Presidential Elections towards the end of 2011. However, the decline was apparent before this from a high in support recorded in May last year, despite some small re-bounds the party support has been in decline. The most recent drop appears to be if anything a little extreme outside of the overall trend, so this may re-bound slightly next month. In all though, perhaps a lack of coverage for the party, and the recent success of Fianna Fail as an opposition party has dented their growth over the medium term. Finally, Independent candidates remain a significant force at a time when people are rebelling against an incumbent government. Support for Independent candidates and other smaller parties has been hovering around high teens and early twenties for the past several months, and in today’s poll it again hits 21%. A move to Independent candidates is often seen midterm, particularly when the opposition parties are not palatable to those that originally supported the government. However the strength of support this wave does at least indicate that the problem for one independent candidate, in this case Ming Flanagan, does not necessarily reflect badly on Independent candidates as a whole. The key message is that to truly understand the political landscape, an analysis of the short term, medium term and longer term trends is necessary, to give real insight into how voters are feeling and how the trends may continue in the future.